La Palma’s bright white building with neon sign looks completely out of place in the neighbourhood. Amongst the other dated shops and cozy restaurants, their airy vibe is sleek - you won’t have a problem locating it. 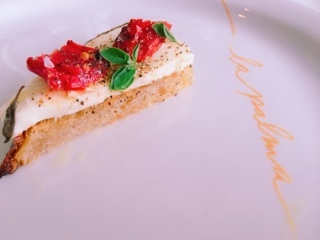 To match their Miami-like décor, the menu’s lighter while still incorporating the Italian classics. La Palma’s definitely a trendier restaurant - there was a fair share of tables downing pink rose – you almost feel like you have to drink something pretty against the white and pastel backdrop. While sipping on wine, an order of the saucisson sec and gruyere ($12) is an ideal nibbler. 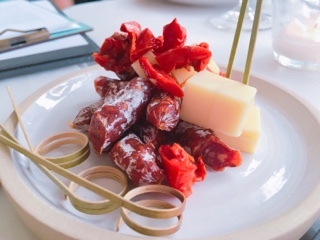 Pieces of cured not overly oily sausage, creamy grueyere, and roasted peppers, it’s that pre-dinner aperitivo that makes you sit back and slow down. You can continue on a tapas journey with their selection of crostini. 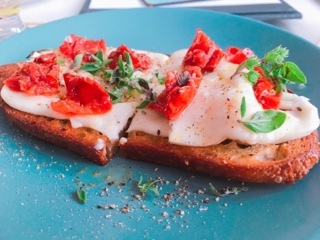 The stracchino, cured tomato, and oregano ($8) version is that delicious combination of oily crunchy bread and creamy cheese that’s mellowed out with fruit and herb. La Palma’s certainly generous with the chewy cheese, which forms a blanket of its own over the bread. As for the mains, the carb-based dishes are a hit. The 100 layer lasagna ($18) may be exaggerated, but there definitely plenty of sheets of the fresh silky pasta. 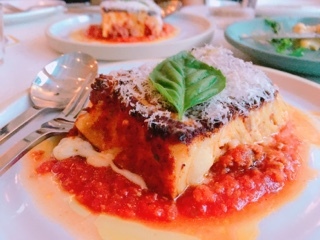 Having had lasagna at an Italian friend’s place numerous times, it definitely tastes authentic. Firstly, the restaurant uses plenty of sauce so the cheese doesn’t get overly crusty; there’s a coloured crust, but the dairy should stay relatively hydrated and gooey. Moreover, the ingredients are simple: fresh pasta, a meaty bolognese, milky mozzarella, and some basil for garnish is all you need. 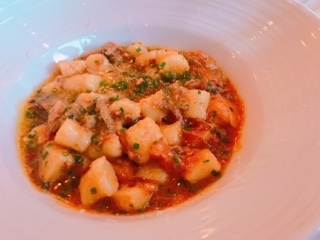 The potato gnocchi’s’ ($17) consistency is the perfect soft chewiness that’s delicate but not mushy. The trick must be to keep them small so they’ll cook quickly and allows each bean-sized pasta to be covered in plenty of the braised oxtail sauce, creating a well-flavoured dish. 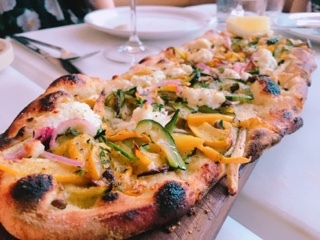 La Palma’s zucchini pizza ($15) is a must. The thin slices incorporate creamy ricotta cheese and a bit of texture from chanterelles. A zip of lemon really wakes up the pizza and the chewy dough with crispy edges makes you want to inhale slice after slice. 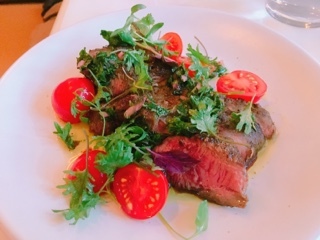 The flat iron steak ($17) could be cooked a touch less (we were advised it’d arrive medium rare, but it was definitely medium); nonetheless, the beef was nicely seared and there was a fair portion to go around. The chermoula sauce adds an earthy freshness with a garlic, coriander, cumin, and lemon base. For those who like chimichurri, it has a similar taste without the acidity of vinegar. For a well-balanced meal, the restaurant offers plenty of vegetables. 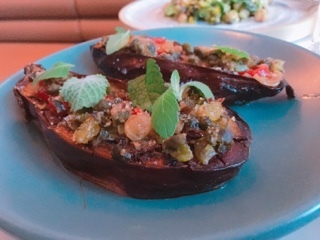 I would have thought the graffiti eggplant ($13) would be a favourite – baked charred eggplant with raisins, picked chili, and mint… sounds heavenly already. Yet, it was so salty that all other tastes were non-existent. Sweet raisins? Heat of the chili? Refreshing mint? Forget it. With so many restaurants featuring cauliflower ($11) on the menu, it’s becoming difficult to standout. 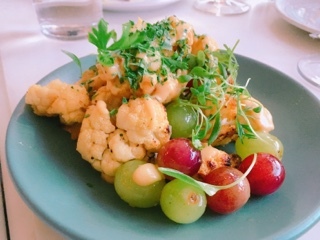 La Palma uses the typical grilled florets and adds roasted grapes (their famous addition to Campagnolo’s burrata), but somehow grapes and cauliflower really don’t have the same iconic pairing as fruit and cheese. 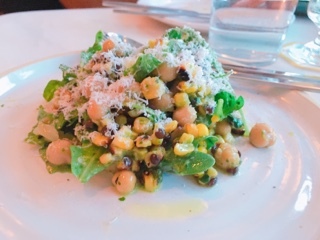 Of the vegetables, the corn and beluga lentils ($12) was my favourite, the mixture further enhanced with chick peas, salty feta, and an arugula pesto that’s a great alternative to the stronger basil. With parmesan shaved on top, the dish could be a hearty salad as well as a side. For those who have visited their sister restaurant, Campagnolo, how does this compare? La Palma certainly has a more extensive menu with tons to choose from. However, with the wider net there are some hit and misses. However, their menu is definitely more vegetarian friendly and goes with the airy atmosphere of the place. 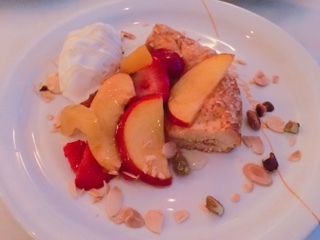 Thinking the peach crostata ($10) would be a lighter fruity end, the dessert was surprisingly sweet… perhaps a bit too much honey drizzled over everything? The fruit itself was enjoyable, but the sugary shortbread with equally sweet pastry cream was a bit much. 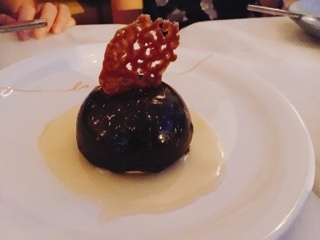 So much so, that I actually enjoyed the caffe corretto mousse ($10) more – when chocolate desserts are normally not my thing. Yet, it was well-balanced with the bitterness from the espresso taming the chocolate. For a small portion, it’s still a rich dessert that’s best shared. La Palma and Campagnolo shares equally friendly and hospitable staff. When my friend asked whether they had any doughnuts left for dessert, our waitress noted these are made daily in the morning and once they’re sold out it’s not replenished. However, she’d check with the kitchen to see if there’s any remaining and would set them aside. 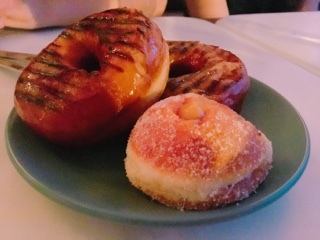 Indeed, three of them came out with dessert, so we could taste the grilled hibiscus honey doughnut ($3.25) they’re known for. In the end, although yummy, it’s just a traditional honey dip that’s grilled. Of course, the dough is more flavourful with a lovely sweet yeasty scent, but it’s also really dense. If they were only airier it’d be fantastic … although to be fair, if we had them fresh in the morning it could be completely different. The salted caramel-filled doughnut ($3.50), on the other hand, was heaven. The pastry cream light and flavourful and the doughnut oh so soft. To be able to shove one into your mouth and just let the cream erupt … now that’s living the Italian dream.